Destiny Tompkins of New York took to Facebook last week to accuse a Banana Republic store outside of New York City where she works of discrimination. In her now viral post, Tompkins claims that the manager of a Banana Republic inside the Westchester Mall told Tompkins that her braided hair was “too ‘urban’ and ‘unkempt’’’ for the store’s image. "So today I went into work at Banana Republic at the Westchester Mall and after the district manager (a white woman) popped in for a visit, I was told to go to the office to speak with my manager, Michael (Mike), who is a white man." "I came in and he questioned me about the dress code and immediately, I thought there was something wrong with my outfit but he sat me down and questioned my hair instead. He told me that my braids were not Banana Republic appropriate and that they were too 'urban' and 'unkempt' for their image. He said that if I didn’t take them out then he couldn’t schedule me for shifts until I did." "When I tried to explain to him that it was a protective style for my hair bc it tends to become really brittle in the cold, he recommended that I use shea butter for it instead. I have never been so humiliated and degraded in my life by a white person. In that moment, I felt so uncomfortable and overwhelmed that I didn’t even finish my work shift and ended up leaving." "When my friend’s mom called the store to find out my manager’s last name (only been working there a month so idk it), he refused to give it to her. 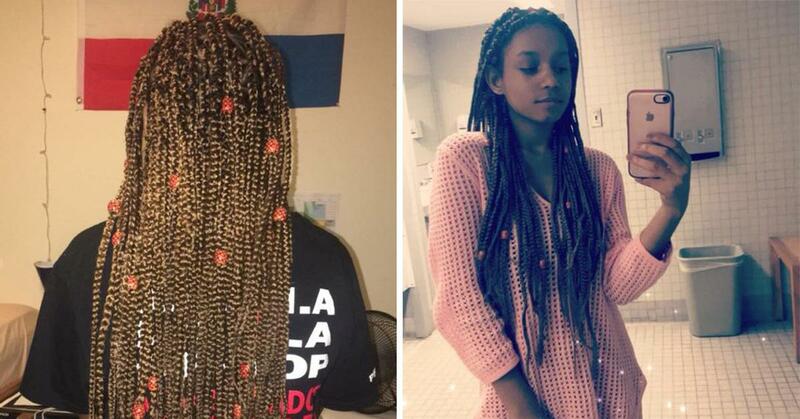 Box braids are not a matter of unprofessionalism, they are protective styles black women have used for their hair and to be discriminated against because of it is truly disgusting and unacceptable." "Make this public [because] they need to be exposed for their blatant racism and discrimination. There’s no reason why a white person should feel allowed to tell me that I can’t wear my hair the way that I want bc it’s too black for their store image." After her post went viral, Tompkins told ABC 7 that she plans on quitting her job and is considering legal action. She says she wants this manager to apologize, to be disciplined, and to understand why she was offended by the comments. In a later statement, the chain confirmed that the store manager has been terminated. "This week, one of our store managers questioned an African American employee’s braided hair style," a spokesperson told Buzzfeed. "Our team began an immediate investigation and the manager involved was promptly removed from the store. Today we concluded the investigation and can confirm that the manager has been terminated from the company. Banana Republic has zero tolerance for discrimination. This situation was completely unacceptable, counter to our policies, and in no way reflects our company’s beliefs and values." "Yeah I interviewed there once," one commenter claimed. "They have an 'image' to uphold. I wouldn't care if my employee was wearing a burlap bag. It is how the person's work ethic and character measure up. Silly, ignorant [people] like him that focus on the wrong things smh. Yeah he didn't wanna give his name [because] he knew he was wrong." "I was just having this debate about interviewing with braids. You would think I'm 2017 it shouldn't be discriminations however you've proved nothing changed. Super proud you stood your ground."